The Bulls gave the Celtics a scare, the Jazz closed out what could be the last stand of the Clippers big three, and the Warriors still look absolutely unbeatable (even with Mike Brown stumbling around on the sideline). Most importantly, our NBA model swept the first round – going 8 for 8 on series predictions. Round two promises to bring more competitive series’ with higher-quality matchups (or at least that is the hope). As explained further in our methodology article, our predictions shown below are calculated by averaging the probabilities computed from three separate models. 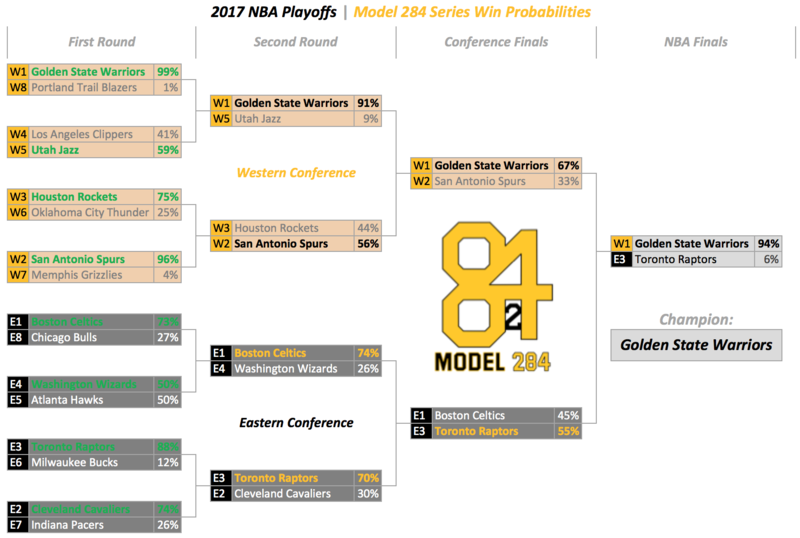 In round two, all three models are all in agreement on the Warriors, Celtics, and Raptors advancing. Conversely, two models have the Spurs advancing and the third sides with the Rockets (as you might expect with a probability hovering close to 50/50). While most of these predictions are fairly chalky, it is notable that none of our models pick the Cavaliers to beat the Raptors. Our models have typically under-valued LeBron’s teams, predicting them to lose before they actually do. For example, last year our models had the Cavs making the Finals but only gave them a 35% chance to beat the Warriors, and in 2015 had them barley edged out by the Hawks in the Eastern Conference Finals (a series they actually swept). While one would hope that models could pick up on LeBron’s cyborg-like talent, on some level it is not surprising that the models miss on a team that typically under-performs during the regular season. This could be the series where we find out if the Cavs really are the inconsistent, defensively challenged team that closed out the regular season, or if they can flip their “playoff switch” and mow down a weak Eastern Conference to reach LeBron’s 7th consecuitve NBA Finals. The table below shows the results of 10,000 simulations of the NBA playoffs from the second round on. Will the model continue it’s dominance? Will the Raptors upset the Cavs and end Lebron’s reign over the East? Will the Warriors be adequately entertained with the nightlife in Salt Lake City? Bring on round two!